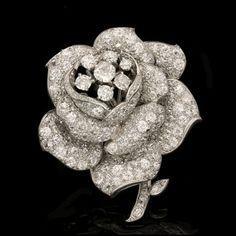 Described as a pavé-set diamond rose clip brooch by Cartier London, circa 1935, the pictured brooch was previously offered for sale at Hancock's London. I do not believe this has been seen on any previous royal woman, so we could be looking at a new addition to the collection as well as a public debut for The Queen; it is worth noting, though, that King George VI and Queen Elizabeth were collecting many pieces from Cartier in that timeframe. It's an absolutely lovely design, and certainly seems suited to The Queen's taste. She has many other floral brooches, of course, and also plenty of Cartier designs, such as the Nizam of Hyderabad Rose Brooches and the Williamson Diamond Brooch.